The Puppy buyer is responsible for all costs associated with shipping their new puppy. This includes the airfare, an airline approved crate, and a health certificate necessary for flying. I have had wonderful success in shipping my puppies with minimal problems. I will make all of the arrangements for the flight at appx. 14-20 days prior to your ship date for your puppy and will email you the flight information so that you can print it off and have it with you when you go to the airport. You will need a photo ID to pick up your puppy. Western Montana winter in the valleys are typically mild with occasional drops in temperatures for short periods of time that would preclude their flying. In December, we can have valley fog that will also inhibit being able to get out of the Missoula valley, but that is minimal & variable. The lowest temperatures for leaving the Missoula Airport are 10-20 degrees, depending upon which airline that we choose for your area of the country. Summers do not often present problems in being able to ship your puppy, as we usually have a temperature drop to a cool and pleasant level at night, which is perfect for the early morning flights. Delta Airlines does offer a counter to counter program that is more expensive, but does allow for the pups to be able to reach their destination during the higher temperatures. We also have to ensure that temperatures for airline stops enroute also do not fall below 10-20 degrees or above the summer recommended high of 85 degrees. Again, their are some select airports around the country that have special summer programs. The puppies travel in the cargo area of the plane where it is climate controlled for their comfort. I use clean shredded paper for a bed to keep them cozy and snug and also acts almost like a kitty litter in the event they potty or soil in their crate. They will have water available to them that has been frozen in their water dish the night before that will slowly thaw and a small amount of kibble for snacking. Most puppies arrive with a dry and clean kennel, but ready to go potty as soon as possible. However, be sure that you wait until you get home or to an area that is not frequented. To alleviate any fears or concerns that you may have regarding the shipping of your new little one, I have already taken steps to help make their trip an easy one during their training. The sounds of the clippers and the clipper vac are similar to those of an airplane. The puppies are typically comfortable and content in the crate for the necessary period of time shipping requires. I do not tranquilize my puppies, but occasionally will use Bach's Rescue Remedy to relax them for the journey to the airport. They have already been acclimated to whatever weather we are having at the time, with access to an abundance of fresh air and the freedom of the great outdoors. The thought of the flight is harder on the new families that are anticipating their new little arrival, than on the puppy itself. A long car trip can actually be more of a risk for a pup as they can come in contact with many different diseases and animals at rest areas or places that are frequented by many people during a potty break. The time in the car and motels however, can be an awesome imprinting time for the new owner and their pup. You just want to be very careful where you choose to stop. Even though your puppy has been wormed, he/she has had only his/her first Parvo/Distemper Vaccination, prior to leaving our home. Shipping is done via United/ Delta or / Horizon/Alaskan Airlines which are the only three that are available to us out of Missoula that will ship puppies. Most flights have at least one connection with the exception of going into Denver, SLC or Seattle. Costs will vary from airline to airline depending on what area of the country that the puppy is being shipped. An estimated current cost at this time of writing is approximately $300 (subject to change without notice) and going into Alaska will run more with Alaskan Airlines. We use a 200 series crate which currently costs $60.00 (price subject to change) and is of course yours to keep. I try to get the best price available at the time on the crate for my families. Due to the high and climbing fuel costs around the country, we have seen a significant increase in costs to ship puppies and it can change at anytime so prices listed are approximate. The Health Certificate required by the airlines is $35.00. To help prepare your puppy to meet "you", we recommend that you send a shirt that has been worn by yourself and/or different family members to be in the crate with them. Please have it to us by the time they turn 6 weeks of age when final payment on your puppy is due. This will enable him/her to recognize your scent immediately when you pick them up at the airport. In the event you are picking up your pup and wish to send a shirt, your puppy will have individual time with that shirt. It will not be put with the litter because there probably wouldn't be one left to come home with him/her. Be sure and put the shirt in a gallon baggie and label it with your name. We highly recommend the Snuggle Puppy that has a heartbeat and warmer to give them a sense of security and companionship while traveling and when they are home in their crate. There are several color options to choose from as well as a really cool harness and doggie blankets. We rub it on their mom, litter mates and on us so that they leave with our scent and that which is familiar to them up until they leave our home. They are also an excellent option for children that have trouble sleeping at night and need something to snuggle with. 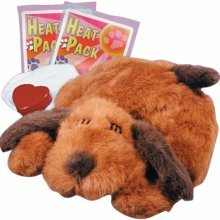 The warmer and heartbeat give them a sense of someone being in the bed with them and bring comfort to a child. This is what a snuggle puppy looks like and what comes with it. They are an awesome option and companion for your puppy during and after the adjustment to your home. In essence, its like bringing one of their siblings home with them. Please let us know ahead of time and we will have the puppy of your choice ordered and available when you pick up your baby or for the crate when they are being shipped.